Angela Banks (MPP ’97) is a senior attorney for the U.S. Social Security Administration. Latesha Love-Grayer (MPP ’02) is a senior policy analyst at the U.S. Government Accountability Office. Farouk Ophaso (MPP ’06) serves on the minority staff of the U.S. House Committee on the Budget. Ciera Burnett (MPP ’09) is a Foreign Service officer with the U.S. Department of State. And Evan Raleigh (MPP ’12) directs Winston-Salem’s Office of Business Inclusion and Advancement. Not only are these all Ford School graduates, they are also alumni of the Public Policy and International Affairs (PPIA) program, a summer training institute that prepares fellows—all students from backgrounds traditionally underrepresented in policy leadership—for graduate school, and careers of influence, in the field. PPIA also helped bring Torres to the Ford School for her master’s in public policy. “We had a reception at someone’s apartment—a student’s apartment—and professors came out,” she says. Banks, Love-Grayer, Ophaso, Burnett, Raleigh, Vargas, and Torres are just a few of the 4,500 alumni of the Public Policy and International Affairs (PPIA) fellowship program. Over the past 35 years, many of those alumni have come to the Gerald R. Ford School of Public Policy for the fellowship’s undergraduate summer institute, to complete their graduate studies, or both. The fellowship is based around the PPIA Junior Summer Institutes—a national initiative launched by the Alfred P. Sloan Foundation (link is external) in 1981. These seven-week long institutes bring students from diverse backgrounds to the campuses of top public policy programs, where they take a rigorous course load. At Ford, that curriculum is focused on training students in quantitative and applied policy skills through courses in statistics and economics, and through rotating policy seminars, many taught by prominent faculty, that cover a variety of policy challenges. These summers of hard work and networking have helped to train a generation of public service leaders. Most alumni of the Junior Summer Institutes go on to complete graduate degrees in public policy or international affairs. Today, PPIA Fellows serve as Foreign Service officers for the State Department and USAID; as administrators in federal, state, and local government; as policy advisors for the United Nations; and as program managers, research analysts, fellows, consultants, and more for a wide array of groups, both public and private. Alumni of the program have tended to rise up to important positions—and many credit PPIA for setting them on the course. Seventeen PPIA alumni are currently working on master’s degrees at the Ford School—12 of whom attended the summer institute here, as well. 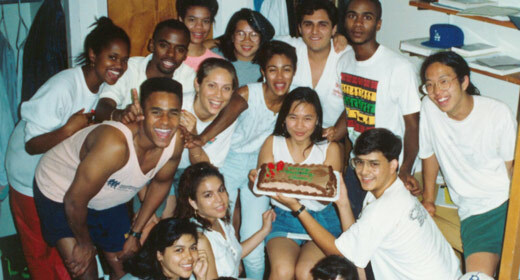 According to Beth Soboleski (MPP ’89), director of admissions and recruiting and PPIA Board of Directors secretary, this is one of the largest groups of PPIA alumni studying at the Ford School at one time, something made more significant by the Ford School’s unwavering commitment to the program. Current Ford students who went through the program reaffirm many of the experiences and benefits described by Vargas, Torres, and Soboleski. “PPIA gave me the tools I needed to excel beyond my undergraduate career,” says Cortney Sanders (MPP ’17), who first came to Ford as a PPIA fellow in 2013. “PPIA for me was nothing short of a life changing experience,” says Melvin Washington (MPP ’18), another 2013 fellow. In the past, over 20 public policy schools offered the Junior Summer Institute to undergraduates as part of the PPIA fellowship program. But as external funding was redirected, many institutions stopped offering summer institutes. The Ford School, however, has offered a Junior Summer Institute each summer since 1983. When the program began, both the summer program and graduate fellowships awarded to participants were fully paid for by external foundations. When outside funding for PPIA ended in 2006, the university and the Ford School stepped up to provide funding for the full costs of the summer program, including room and board, a stipend for each fellow, summer instruction, as well as a guaranteed graduate fellowship of at least $5,000 for PPIA alumni who choose to continue their studies at the Ford School. “That’s a decision we’re all really proud of, and one we continue to support to this day,” says Collins.